For Michael H. Schill, who became the University of Oregon’s 18th president on July 1, life is all about exploration, investigation, and learning new things. Which makes his new job ceaselessly rewarding. “One of the things I love most is discovery, so I’m excited about meeting with faculty members and learning all of the areas in which the university is excellent. Each one of those is going to be like a little present,” he says. Schill joins the UO after serving as dean of the law schools at the University of Chicago and University of California, Los Angeles. Earlier in his career, he was a tenured professor at New York University and the University of Pennsylvania. He earned degrees from Princeton and Yale Law School. He emphasizes, however, that the success he envisions for Oregon will come on its own terms, and not in relation to some other—perhaps better-known—institution. “I will work every waking moment to make this place better. Not so it is identical to the University of Chicago, not to make it identical to UCLA or NYU, or any other school, but to make it as good and authentic and true to its history and its traditions as the University of Oregon can be,” says Schill. For the UO, that means building the faculty and the research intensity of the school. “The University of Oregon is an excellent university that has for years been a pioneer in combining the liberal arts and sciences with the professions.” Over the next five years Schill plans to hire 100 tenure-related faculty members in addition to replacing professors who will retire or leave. Each professor will need to be proficient at scholarship and teaching. In addition, Schill is committed to making sure that higher education remains accessible to students, regardless of who they are or where they came from. Schill and his sister Margo were the first in their family to attend college, so he is particularly interested in seeing that students like him have that opportunity. In the coming months, the UO community will have many opportunities to learn the details of its new president’s vision, priorities, and aspirations for the university. 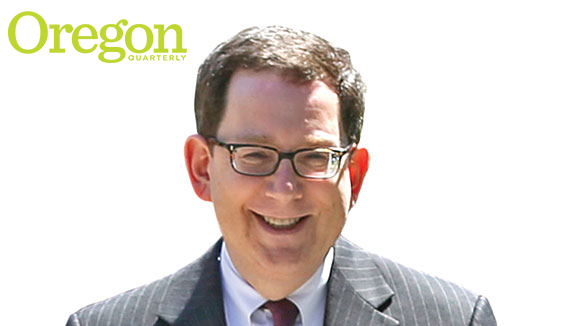 In the meantime, OQ asked President Schill about some of his first impressions of Oregon, and what drew him to the UO.